AUSTRALIA: Australia has seized more than Aus$1.0 billion (B289.40 billion) of crystal meth its biggest ever bust of the highly-addictive drug, police said today (Dec 22). Commonly known as “ice”, the massive 1.2 ton haul was intercepted after being offloaded from a boat, the Valkoista, which authorities believe came from China. Australia has the world’s highest per capita consumption of crystal meth and the country has become an increasingly attractive destination for drug-smugglers, with street prices soaring. Much of the ice hitting its streets comes from China and the Golden Triangle region where the borders of Myanmar, Thailand and Laos meet. Eight men, all Australian, were charged with either importing a commercial quantity of a border controlled drug, or possessing a commercial quantity of a border controlled drug, and face life in jail. The seizure capped a six-month investigation with Australian Federal Police Deputy Commissioner Leanne Close alleging the ringleaders had been taken out. “It equates to probably about Aus$1.0bn of border controlled drugs that are no longer going to be on the streets of Australia over the Christmas period,” she said. The Valkoista arrived at the port of Geraldton in Western Australia in the early hours of yesterday morning (Dec 21). The drugs were allegedly offloaded into a white hire van before tactical response officers swooped in, arresting three men inside. Simultaneously, they boarded the boat and detained three crew members, with two others arrested at a hotel in Perth. An Australian Crime Commission report in 2015 found that while US$80 (B2,620) bought one gram of ice in China, the estimated 270,000 users in Australia had to pay US$500 (B16,375) for the same amount. The previous biggest meth bust was 903-kilograms, found in Melbourne earlier this year. Australia has identified China and India as key sources of the precursor chemicals needed to make ice, while China and Myanmar were notable manufacturers of the end product. 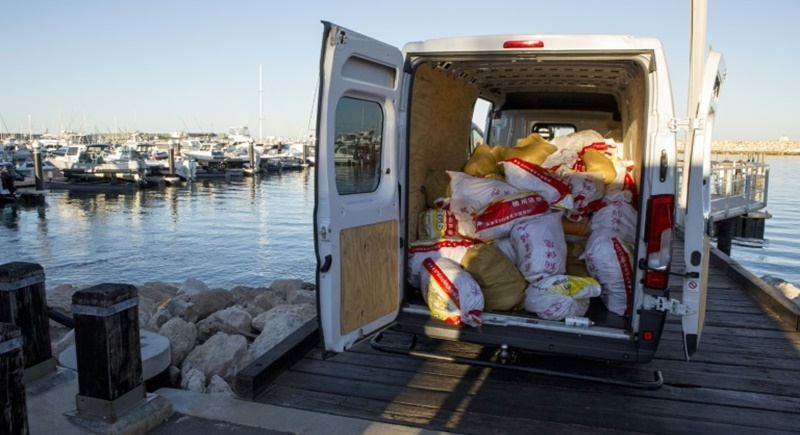 Photos of the raid released by Australian Federal Police showed the van stuffed with large sacks that were stamped with Chinese characters for animal feed. In recent years law enforcement agencies across Asia keep making record busts but the seizures appear to have little effect on the sheer amount of ice hitting the streets. In September, Canberra announced a new strategy to tackle the menace, involving reinforcing information-sharing arrangements with Interpol and Europol to better pinpoint organised crime groups. It is also working more closely with counterpart law enforcement agencies in China, Hong Kong, Taiwan and the Mekong region of Southeast Asia to smash syndicates and follow money trails.